The level of productivity, in the production, determines the profitability, efficiency and performance of the enterprise, i.e. 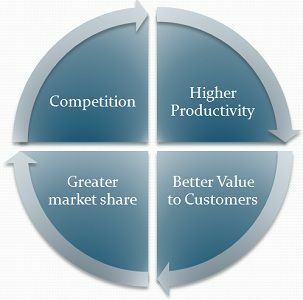 the higher the productivity of the firm the greater will be the earning capacity. It aims at determining the relationship between the input and output, in a particular production process. In short, it is nothing but attaining the highest possible outcome, while consuming minimum factors of production. Productivity is often misconstrued with production, but there exists a difference, in the sense that production indicates the volume of output, whereas productivity is the output generated from the resources employed by the company. This article attempts to shed light on the differences between production and productivity. Meaning Production is a function of an organization which is associated with the conversion of range of inputs into desired output. Productivity is a measure of how efficiently resources are combined and utilized in the firm, for achieving the desired outcome. Production can be defined as the systematic activity of gradually transforming one form of material into another while maintaining the requisite quality and are capable of satisfying human wants. It tends to combine, tangible inputs, i.e. raw materials, and intangible inputs, i.e. ideas, information, etc. to turn it into finished products for sale, through a mechanical or chemical process. Job-Shop Production: A production process, in which few products are created according to the demand of the customer, in the stipulated time and cost. In job-shop production, product volume is low, and variety is high. Batch Production: Batch production is one wherein product passes through various stages over a series of functional departments, and a number of batches are produced. Mass Production: It is a manufacturing technique in which discrete parts are produced with the help of continuous process. Continuous Production: The process of production in which the production facilities are sequenced as per the production operations chronologically. Productivity is a measure that gauges the efficiency of the production process, i.e. in transforming inputs such as raw material, labour, capital, etc. into the output of finished goods. It can be expressed in terms of the ratio of outputs produced to inputs consumed, in the given period. Productivity tends to determine the overall production performance of the firms by ascertaining how efficiently the firm utilized its resources in the production of goods and services, with minimum wastage. It can be enhanced by controlling factors of production, improving process and technology. Trend Analysis: It gauges the change in productivity of the firm over the years. Horizontal Analysis: It compares the firm’s productivity, with other firms of the same size and business. Vertical Analysis: It compares firm’s productivity, with other firms of various size in the same industry and with other industries. Budgetary Analysis: Establishing productivity norm as the budget for the upcoming period, on the basis of above analysis and making strategies for its achievement. Production is an organized activity, wherein step by step conversion of raw materials into useful output takes place. On the contrary, Productivity is an indicator of efficiency in the production in terms of optimum utilization of firm’s resources in the creation of desired output. Production is a process of value addition, wherein at each level, some value is added to the product. Conversely, productivity is a measure of efficiency. Production exhibits the number of units produced by the firm in a given period. As against, productivity highlights the ratio of output to input consumed. Production is always expressed in absolute terms, i.e. the volume of output produced. On the other hand, productivity is denoted in relative terms, meaning that it determines the quantitative relationship between output generated and resources consumed. While production ascertains the value of output generated, productivity determines the how well the resources are utilized by the firm in the generation of output. By and large, production and productivity are not contradicting terms, but these are closely connected one. Production is a conversion process, in which the firm is engaged, whereas productivity is all about how efficiently the company allocates its factors to produce the output, with least amount of wastage and essential quality. In short, the efficiency in production is the firm’s productivity.